Ravyn stands as a beacon of hope within a sect consumed by an apocalyptic vision of the future. Off the field she possesses a calm and pious wisdom. In battle some believe her to be invincible. She takes no joy in killing, but neither does she shirk from it. When Scyrah is restored, the warcaster plans to embrace peace as readily as she now welcomes war. Ravyn is seen as a fighting embodiment of the righteousness of the Retribution’s holy cause. Ranking above captains and thanes, scyirs are trusted to lead large, mixed task forces that include all branches of their own order as well as other warriors of the Retribution. Most are sons and daughters of nobility who have proven themselves to be the elite of the elite, the pinnacle of Dawnguard martial coordination, with tremendous skill at coordinating myrmidons alongside their subordinate soldiers. Dawnguard Scyir comes in a blister. 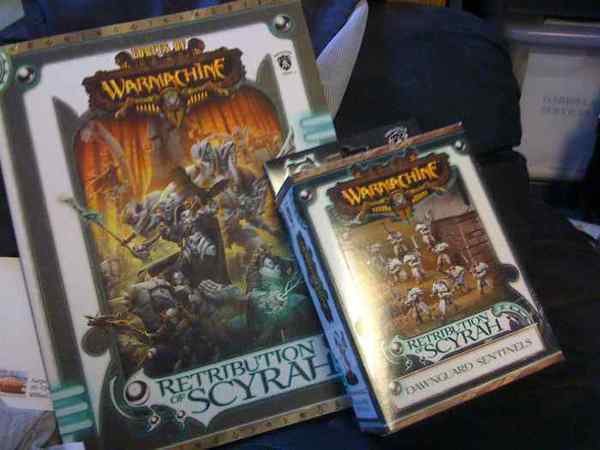 A player may field two Dawnguard Scyirs for each warcaster in his Retribution army. Jeg synes nå i bunn og grunn malingen begynner å se helt hederlig ut. Trollkin sorcerers of this tradition have learned how to manipulate rocks and stones with their minds. Runes are a focus for their power, and at a runeshaper’s call heavy pieces of stone rise to form floating patterns around him, ready to hurl with killing force or interpose against incoming attacks as a whirling protective barrier. The blight has twisted the minds as well as the flesh of these ogrun, addicting them to the joy of bloodlust. If their enemies are not killed outright from the impact of their spears, the tremendous lengths of wood dangling from the creatures’ vitals can trip them up long enough for the blighted ogrun to close and finish the job. Crush the enemies of the Motherland with the awesome Extreme Juggernaut available exclusively from Privateer Press. This massive metal model towers over the standard Juggernaut and makes even the mighty Behemoth question its name. With over 29 individual parts, the Extreme Juggernaut is a hobbyist’s dream, able to be positioned in nearly any pose imaginable! The third in our series of Extreme sculpts—and the first for WARMACHINE—this masterpiece of Motherland engineering will be available only while demand lasts. Trollkin called Fennblades calmly wait shoulder to shoulder—wicked hooked greatswords raised at the ready—listening to the approach of thundering hooves. Some duck lances to sweep blades through the legs of mounts while others swing their blades straight into the chests of the riders. The result is always the same, as Fennblades stand victorious over the bodies of the slain. 0 Warcaster attachments men Soulless kan attaches til units...? Det ser ut som om de er ganske solo-sterke, men det kan være kompensasjon for at de har et relativt lite Merc-soloutvalg. Du og du. Da blir det dataspill ser det ut til.